Mayor Norbert and his staff followed the progress of the legislature’s budget hearings closely – closely enough to be worried about the possibility that the draconian cuts proposed by the governor might actually be adopted this year. Again it took the intervention of Jon Ravelsky to calm them and remind them that the state’s budget process was a multi-part production in which the public events – the governor’s budget address and the legislative hearings – were little more than a show orchestrated for public consumption and to give newspaper reporters something to write about while distracting them from the behind-the-scenes maneuverings, negotiations, and intrigue that only occurred at the very last minute and that ultimately decided how the state would spend its money each year. Even though Ravelsky allayed their anxiety, he reminded them that an important part of this process must be their public courtship of Michael Ianucci. Ianucci was a powerful figure in Harrisburg, he knew it, and he expected anyone who wanted anything from him in the state capital to show their respect and solicit his support diligently, ardently, and visibly. During a staff meeting about the state budget, Norbert decided – over his staff’s objections – that he would take the lead on this assignment himself. All things considered, Norbert did not begin from an entirely disadvantageous starting point. True, in his run for office he had defeated Ianucci’s hand-picked candidate for the Democratic nomination for mayor, but at Ravelsky’s suggestion he had invited Ianucci to lunch the very next day at the Palm, a local restaurant that, while not particularly known for its food, was the place where politicians met with people when they wanted those meetings to be noticed by others and reported in the next day’s newspaper. At that meeting Norbert quickly made peace with Ianucci – and Ianucci, in return, promised to support Norbert in the coming election. Both had lived up to their promises. Norbert made the maximum contributions allowed by law to Ianucci-supported candidates for council – incredibly, six of the seventeen members of council owed their positions almost entirely to Ianucci’s support and patronage – and provided ample cash to fuel Ianucci’s election day operations on the streets of Philadelphia. Ianucci’s political machine, in return, produced massive pluralities for Norbert on election day – in many cases, ninety percent or more of individual polling precincts’ votes. Since the election, the relationship between the two men had been cordial, if not warm. Norbert had taken great pains to assure Ianucci that he had direct access to him at all times, and while Ianucci took advantage of that access only infrequently – it would have been viewed by others as a sign of weakness if he sought the mayor’s help too often – it was always there when he asked for it. They attended many political and civic events together, frequently sat together and talked, and appeared to enjoy one another’s company. Whereas the mayor’s staff took responsibility for the daily care and feeding of all other state legislators, Norbert always attended to Ianucci’s concerns himself. Still, the two men did not know one another well and did not entirely trust one another. Norbert assumed that Ianucci’s political organization engaged in at least some illegal political activities, although he had no sense of whether Ianucci was involved with or even knew about such matters. Ianucci, for his part, was extremely leery of wealthy corporate leaders and especially large business owners, assuming that everyone who succeeded in the corporate world did so at the expense of working people. Despite their mutual suspicions they managed to establish a reasonable and productive working relationship that – only a few months into Norbert’s term as mayor – showed every sign of becoming an effective and productive alliance. Now, Norbert needed to put that alliance to the test. The Curmudgeon had jury duty last week. And unless that’s sympathy for the legal system for having to deal with someone like him, stop rolling your eyes. Actually, eye-rolling is probably the default response to the subject of jury duty, beginning with when you go to the mailbox and find the summons. Whereupon you roll your eyes. In late August The Curmudgeon received a notice that he was being summoned to jury duty in October, and last week he served. He has served before. As a resident of Philadelphia he was summoned for jury duty many times. Twice he was rejected as a potential juror for murder trials in which the prosecutor stated that he would be seeking the death penalty and The Curmudgeon, in response to direct questions from the judges, said he would not, under any circumstances, vote to execute anyone. In the second of the two cases the judge questioned his reasoning, to which The Curmudgeon responded first, that voting for the death penalty would make him no less a murderer than the convicted person, and second, that dealing with people who are problems by killing them off in state-sanctioned murders was a sign of the decline of western civilization. Surely you have no trouble imagining this – and a totally different kind of eye-rolling from those in the courtroom. Once The Curmudgeon was rejected for grand jury duty because through various jobs he’s held over the years he was familiar with too many of the people whose names were expected to come up during the proceedings. That was unfortunate, too, because in hindsight, it now seems almost certain that it was one of the most high-profile political corruption scandals in recent Pennsylvania history. After making it onto a jury in a simple assault case – guilty as charged! ­–The Curmudgeon was rejected for jury duty in a civil trial. This happened shortly after the O.J. Simpson civil case (not the criminal trial) and the judge was the same fellow who had been on the receiving end of the lecture about the decline of western civilization a few years earlier. This time his honor asked about The Curmudgeon’s willingness to apply the law as the judge instructed. The Curmudgeon told the judge that he did not accept the concept of “preponderance of evidence” that was so much a part of the Simpson trial and of civil law. The judge asked The Curmudgeon if he thought it was appropriate for him to apply his own interpretation to the law instead of what the judge told him, whereupon The Curmudgeon reminded the judge that he had not asked such a question a few years earlier when he, the same judge who had dismissed The Curmudgeon from one of the capital cases, asked him why he wouldn’t vote for the death penalty. At first the judge looked like he was going to argue, but then his face changed as he realized that his life would be a whole lot simpler if he didn’t have to deal with the guy giving him this lip. Last week was the second time The Curmudgeon has been summoned for jury duty in his eleven years living in Burlington County, New Jersey. 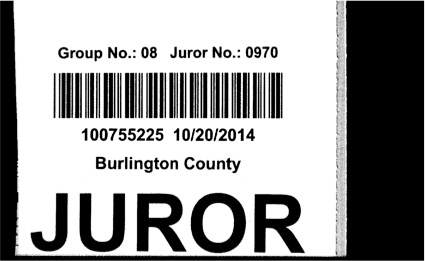 The first time, jury duty lasted only a little more than ninety minutes. Then, the judge himself visited the jury room to explain that he would be hearing a very high-profile case: a woman who allegedly had spiked her brother in-law’s Gatorade with anti-freeze (hadn’t he noticed that it tasted strange, or was he one of millions who has been brainwashed into drinking Gatorade because of its alleged benefits despite its hideous taste, no matter what the flavor? ), killing him and creating a sensation that made both the newspapers and television news. The judge said that he and the lawyers had expected to have difficulty finding people who hadn’t heard much about the case and he had therefore asked the jury duty people to have more people available than usual, just in case. The problem never surfaced, though, and they picked their jury easily but the judge took the time to come to the jury room, explain the situation, apologize for the inconvenience, and thank the gathered for their time. It was the only new trial of the day, so by 10:30 everyone was gone. Unlike in Philadelphia, which has a one-day/one-trial jury duty program, Burlington County has a two-day/one-trial program. They make it pretty easy for you, though: you check in on the court’s web site the night before, and if they don’t need you, you don’t have to appear. The Curmudgeon was not needed in the morning on day one of his two-day summons but was told to check in at 11:30 on the morning of his first day, and if needed that day, he would have to arrive by 1:00. It turns out they did want him, though, and he arrived promptly at 1:00, as ordered. Surely you’re not surprised to learn that The Curmudgeon is extremely punctual. After a little more than an hour, The Curmudgeon and thirty-five other people were led to a courtroom to be examined as potential jurors in a civil case involving an auto accident. The plaintiff was suing the man who hit his car and injured him. The driver of the offending car admitted to fault, but the question before the court was not fault in the accident but whether the offending driver should have to pay damages for what the plaintiff claimed were permanent injuries. The job of the jury would be to determine whether the injuries were permanent, and if so, to assign a financial value to those injuries. Pretty much everyone who’s ever been summoned for jury duty spends a little bit of time and engages in more than a little bit of speculation about how to answer questions during jury selection in a manner that will get him or her dismissed as an unsuitable juror. A prospective juror in a civil case has many such opportunities: you can say you’re highly suspicious of people filing lawsuits over pain-related issues; you can talk about sleazy lawyers; you can say you think insurance should cover everything and, if the plaintiff didn’t have insurance, that’s too bad; since the case was about neck and back injuries and the judge was asking everyone if they had any neck or back injuries, you could say you did have such injuries; you could say you knew someone who was screwed in such a case (the judge specifically asked whether prospective jurors had ever sued anyone, been sued by anyone, or had a family member who sued or was sued); you could say that you testified in a trial at some point in your life and had a really bad experience (the judge asked about this); or you could say you hated Dancing With the Stars since the judge, who asked people to tell a little about themselves and, when they hemmed and hawed over such an easy question, asked them (among many other inquiries that seemed irrelevant and foolish to the prospective jurors but presumably were useful for the lawyers) what television programs they watched and made it clear that he and his wife were especially fond of Dancing With the Stars; or you could do or say any of a number of other things that would easily get you sent back to the jury room or home. It doesn’t take a whole lot of imagination to think of ways to piss off people; married people, The Curmudgeon has observed, seem to be especially good at this. But then the damnedest thing happened: thirty-five of the thirty-six people in the group played it totally straight and offered nothing but straightforward, honest answers. They weren’t trying to get out of jury duty. Only one person tried the expected trickery, but she would have been dismissed anyway because she suffered from serious back problems. Otherwise, despite the rolling of the eyes when the summons arrived, despite the speculation about how they could get out of jury duty, despite the inconvenience we all associate with jury duty, everyone just…did their duty and answered the questions honestly. Some people were dismissed for cause – one had lost a lawsuit, another had worked for lawyers for more than thirty years, and others had been involved in numerous legal proceedings – but the lawyers had a decent pool of people from whom to choose. 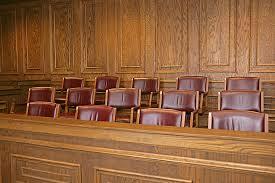 Including The Curmudgeon, who was eventually selected to serve on the eight-member jury. And then, another damnedest thing happened: the judge entered the jury room and sat down at the conference table to talk to his jurors. He explained that he was a retired judge who was working on a part-time basis and said that while he could make more money as a mediator, his favorite part of being a judge was being around jurors. That was obvious during the case: he clearly enjoyed the jury selection process, asking the jurors questions and interacting with them, and during the trial he welcomed input: jurors wanted certain people to speak louder, they preferred the work of one of the translators over the other, they requested bathroom breaks, they wanted a window shade lowered, and he responded to it all with deference and good cheer. Then, he rose, walked to the door, thanked us again, and shook every person’s hand as they left. And The Curmudgeon had just one unfinished piece of business to attend to. As noted above, the plaintiff was Korean and clearly could speak and understand English – not well, but he could. When some of the questions asked of him required only a yes or no answer, he would sometimes nod before the translator finished relaying the question. Occasionally he would offer one or two words in English to reinforce the translator’s rendition of his response. Both of the defendant’s lawyers attempted to make a big deal out of this, implying that the plaintiff was somehow trying to deceive the court. This was the only time during the trial that The Curmudgeon rolled his eyes – other jurors did, too – and when it was all over, he stopped by the defense table to have a final word with those lawyers. “The way you treated that guy was despicable,” The Curmudgeon began. Surely you have no trouble envisioning The Curmudgeon doing this, either. The two lawyers had won, so they didn’t care, but when The Curmudgeon turned and walked away, he left them with their mouths agape. Finally, The Curmudgeon doesn’t mean to preach – okay, who’s he kidding, he loves to preach – but he does want to say this: don’t try to get out of jury duty. It’s an important thing to do: if you ever needed to have your day in court you’d want to be judged by people like yourself – a jury of your peers – and serving on a jury is personally and emotionally rewarding. Even though the case was settled, The Curmudgeon and his seven fellow jurors, as we marched together down High Street in Mt. Holly one last time, were proud of what they had just done and felt as if, in their own way, they had made a small contribution to making this world a better place. Think it doesn’t matter which party controls Congress? A few pet peeves in the world of nouns and verbs. Once upon a time, someone who was there one day but not the next was said to have disappeared. Now, they have “gone missing.” Exactly how does one “go missing”? When did the supporters of a sports team, formerly known as its fans, become its “fan base” instead? Attention, please: something either is unique or it’s not. It’s not a little unique, it’s not pretty unique, it’s not very unique, and it’s not the most unique. It’s unique or it’s not. When in doubt, cast the word out. The plural of chair is not “chair’s.” The plural of tamale is not “tamale’s.” People who don’t understand this are dummy’s. When did we start using “funds” instead of money? Not long ago one of The Curmudgeon’s neighbors, faced with an increase in her monthly condo fee, declared that “I don’t have the funds for that.” “Funds?” It’s not a government appropriation, lady: it’s money. Once upon a time, we were said to have certain skills. Now, we have “skill sets.” Why? Why? When – and why – did our medicine become medication? Speaking of pharmaceutical products that we ingest: you’re sick, so you go to the doctor, who gives you a prescription. When did that prescription become a “script”? If it’s a script, do you get to choose what role you want to play? Because if you do, The Curmudgeon wants to play the George Clooney role, since he’s a dead ringer for the famous actor. The Curmudgeon wears pants: short pants, long pants, pleated pants, straight front pants. Pants. Not trousers, not slacks. Is there any reason, ever, to refer to these garments as trousers or slacks? Once upon a time, the baseball player who hit second in his team’s batting order was said to hit second; the player who hit fifth was said to hit fifth. Seems pretty simple. Now, though, the player who hits fifth is said by some to be hitting in the five-hole; the player hitting sixth is hitting in the six-hole. The Curmudgeon is hard-pressed to understand how this is an improvement. Who made up this new construction? Probably some a-hole. Remember when the guy (or gal) who led a company was its president? President – that’s a damn good title. So why do company presidents now insist on also being called chief executive officer? Isn’t that overkill? And isn’t it especially overkill when you read about some clown who calls himself president and CEO and you learn he’s running a little mom-and-pop business with six employees, which means he has far, far less oversight responsibility than, say, a nineteen-year-old shift supervisor at McDonald’s? In the world of sports, a player who is considered a malcontent or a troublemaker is often referred to as “a cancer in the locker room.” This is an appalling use of the word “cancer” that makes at least some of us who have lost loved ones to that disease absolutely cringe. Food that comes out of a body of water is fish. Why do some people insist on calling it “seafood”? Is there something about “seafood” that makes it more appealing, more palatable, than “fish”? Speaking of food, calling those green, leafy, unpleasant-tasting foods “veggies” instead of “vegetables” does not make them taste any better. The word “veggies” should never, ever be used in any conversation unless one of the participants in that conversation is under the age of ten. Food writers: stop treating your readers like children and call a vegetable a vegetable, for crying out loud. We’re all grown-ups; we can handle it. Still on the subject of food, a memo to the watermelon industry: “seedless” means “without seeds.” It does not mean “without black seeds.” It does not mean “dozens and dozens of white seeds.” It means “no seeds.” None. Zero. Zilch. Nada. Finally, before you’re all fooded out, one more: Attention, TV chefs: the word “paprika” has three syllables, not four. It is “pap·ri·ka,” not “pap-uh-ri-ka.” You may now resume overcooking your risotto. The web site dictionary.com defines “snub” as “to treat with disdain or contempt, especially by ignoring” and “to check or reject with a sharp rebuke or remark.” Clearly, it suggests an active process – something someone sets out to do. There is a tendency in the popular media, however, to call certain passive processes a snub. If a certain actor fails to get an Academy Award nomination, for example, a headline might scream “Academy snubs Jones.” The academy didn’t set out to rebuke Jones or treat him with disdain or contempt; it simply decided that there were more worthy nominees. (And if the Jones that the academy failed to honor with a nomination is Tommy Lee, the academy is stupid.) Similarly, a headline on a local sports web site recently blared “Iguodala snubbed for all-defensive teams,” explaining that a player on the Philadelphia 76ers basketball team was not chosen as one of the best defensive players in all of professional basketball. No one is suggesting that the player in question is a bad player; failure to achieve this recognition is not a check or a rebuke. All it means is that the people who vote for such awards felt there were other players more worthy of this recognition. They did not “snub” Iguodala; they simply said someone else was better. “Visit our showroom for special deals on select models.” No no no. Visit their showroom for special deals on SELECTED models. Not all of them. Some of them. Those SELECTED for this purpose. When people get together to talk, they have a conversation. Or they converse. They do not conversate. The first few times The Curmudgeon heard “conversate” he thought the word was so ridiculous that he assumed its users were just kidding. They weren’t. They were ignorant. Do not – do not – do not – conversate. Are we in agreeance about this? Dictionary.com defines “bimonthly” as “occurring every two months” or “occurring twice a month.” Thanks for clearing that up, dictionary.com. “That’s a whole nother thing.” No, it can be a whole OTHER thing, it can be a whole different thing, it can even be another thing, but it’s most definitely not a nother thing. “The White House is poised to announce a new program for low-income mothers.” “The Phillies are poised to announce the signing of Cole Hamels to a new contract.” “Runners at the Boston Marathon are poised at the starting line, waiting for the gun to start the race.” What on earth does poise have to do with any of this? They are ready to announce. They are prepared to start. Poise is not a factor. In fact, most of those marathon runners are probably anything but poised. Dictionary.com defines poised as “1. (of a person) composed, dignified, and self-assured. 2. being in balance or equilibrium: a balloon poised on the nose of a seal. 3. teetering or wavering: to be poised on the brink of disaster. 4. hovering or suspended in or as in midair: a bird poised in flight; a helicopter poised overhead.” Let’s reserve poise for when it’s really appropriate – you know, things like Miss America contestants, quarterbacks running a two-minute drill, soldiers who keep their heads about them in battle when all around them are losing theirs. Americans hate people in government. The press – reporters, pundits, editorial-writers – all think they’re smarter than the people in government. So why does that press constantly refer to those who govern as “elites” when they so clearly think such people are anything but? “Some 40 percent of those polled are happy with the job the president is doing.” “Some 85 percent of parents hope their children will go to college one day.” “Some”? Some what? It’s 40 percent – or about 40 percent or a little less than 40 percent or a little more than 40 percent. “Some 40 percent?” What does that mean? The Curmudgeon will tell you what it means: it means that some writer, deprived of his speaking voice, is trying to find a way to sound stentorian. He (or she) doesn’t. They just sound ridiculous. The same can be said for “fully.” “Fully 40 percent of those are happy with the job the president is doing.” Really? “Fully” 40 percent? Either it’s 40 percent or it’s not. If it’s not, state the number. If it is, “40 percent” shall suffice. It’s a popular major in college: political science. The Curmudgeon gets the politics part, but science? Really? Is there anything even remotely scientific about the academic discipline they call political science or is this more a matter of people who do very little work for a living believing that if they append the word “science” to the name of their field of study it adds a degree of legitimacy and weight that the field is otherwise sorely lacking? You have a problem; The Curmudgeon feels your pain. He feels even more pain, though, if you say the situation is problematic. If you say it is problematical, the pain is excruciating. Please be kind: your problems are your problems and let’s leave it at that. Conspicuously absent from the parade of politicians visiting Mayor Norbert to complain about Shaniqua Watson’s outstanding performance as Philadelphia’s streets commissioner was state representative Michael Ianucci. Ianucci had his own vast political organization that was both part of the city’s Democratic machine yet also a political machine unto itself. Ianucci even had his own separate patronage mill: in addition to placing many loyal party workers in public agencies like the redevelopment authority, the parking authority, the housing authority, the court system, and the school district, he had developed over the years a vast network of private-sector companies that owed him favors and repaid those favors by providing jobs for his political acolytes. Hundreds of Ianucci loyalists worked in local banks, the electric company, and the gas works; staffed parking lots and parking garages whose owners constantly did battle with the city’s police and frequently needed Ianucci’s help; sold soda, hot dogs, and beer at the city’s sports stadiums and arenas and worked as skycaps, baggage handlers, and retail clerks at the airport; and held clerical and unskilled laborer positions at law firms, insurance companies, hospitals, and colleges that depended on Ianucci for help in their many dealings with government. Anywhere a job could be found that required minimal education and training, few skills, and no imagination at all, Ianucci would seize any opportunity to do a favor for its owner or executives and later seek repayment of that favor not through campaign contributions but with jobs for his supporters. He made honest men and women of the people he placed in these jobs, too: he insisted that they do an honest day’s work for an honest day’s pay and warned them that he would not protect them if they failed to do the job and were fired. Because of this approach to leading his political organization, Ianucci did not view small favors like getting street lights fixed to be a major part of his constituent service portfolio; he and his organization provided such assistance, of course, but they did not consider it central to their survival or success. This explained why he was alone among local officials in not complaining to the mayor about Norbert’s disconcertingly effective streets commissioner. Ianucci also had more important business to attend to in Harrisburg, where his budget committee was holding hearings on the governor’s proposed spending plan for the upcoming year. Three days a week for the past month, different department secretaries and agency directors had appeared before the committee to present their operations’ plans for the coming year and answer questions from inquisitive legislators. Only lobbyists, lawyers, and a few newspaper reporters attended these hearings, not ordinary citizens or even representatives of interest groups or advocacy organizations; years would pass without such hearings seeing a television camera – except for cameras owned by the state’s own cable television network, which in a state of more than twelve million people reportedly had 350 regular viewers. With no gallery to play to, committee members asked dry, technical questions that elicited dry, technical answers; they spoke from their seats, never rising as if cross-examining witnesses; and they accepted, without criticism or protestations of outrage, the answer ‘I don’t have that information with me today but will get back to you and the committee about it as soon as I can’ in response to questions they asked. In short, it was nothing like the circus of a Philadelphia city council budget hearing. Michael Ianucci seldom spoke during these hearings. Because of the respect and fear he engendered and the perception that he wielded the appropriations committee’s ultimate authority, department secretaries and agency directors routinely presented their budgets privately to him and his staff prior to formal public hearings. During such meetings his staff – widely viewed as the best in Harrisburg – asked most of the questions; Ianucci spoke only often enough to ensure that he had his guests’ attention and to convey that he knew as much about their operations as they did. Ianucci also did not wield the gavel during his committee’s hearings because technically, it was not his committee: he was a Democrat in a House chamber in which Republicans held a twenty-seat majority. Unlike in Washington, where the leading minority party member on a committee was referred to as the ranking minority member, and unlike in Philadelphia, where the leading minority party member on a committee had no title at all, the leading minority party member of legislative committees in Harrisburg had a special title: minority chairman. These minority chairmen chaired nothing and their title was little more than a means of funneling slightly larger salaries to a favored few and to pay them in public dollars to do private, party work. As a result, Ianucci technically had no more power than any other member of the committee – but in reality, he had far more power than any of them, including the committee’s chairman. Amid Ianucci’s typically silent performance during recent House Appropriations Committee hearings, things appeared bleak for Philadelphia’s financial prospects. Secretary after secretary and director after director presented budgets that called for large cuts in direct appropriations for Philadelphia and large cuts in programs that primarily benefited Philadelphia, and they all ended their testimony without serious challenge from committee members and in most cases without being questioned or addressed at all. Like the governor, many legislators knew they earned extra points from their constituents for backing anything that would hurt the state’s largest city, and whether they thought doing so was good or bad or right or wrong never figured into the positions they espoused. During such hearings, they found no reason to question the testimony presented to them. But the reasons for the silence of non-Philadelphia committee members ran much deeper. While these legislators supported proposals that would hurt Philadelphia, they rarely voiced that view aloud in the state capital. If they did, they risked incurring the wrath of their colleague, minority chairman Michael Ianucci. House members who crossed Ianucci faced dire consequences: they found funding for pet projects in their districts removed from the state budget; their opponents for re-election would experience sudden and inexplicable surges in campaign contributions; and even their reserved parking spaces outside the Capitol would “temporarily” be shifted to a distant location so the parking lot could be resurfaced – and then never restored when the new asphalt was dry. This could happen to any House member – even those who ostensibly outranked Ianucci, including the Speaker of the House – and even to members of the state Senate. Such punishments could never be traced directly or even indirectly to Ianucci, but they happened just the same and everyone knew who was behind them. All everyone knew was that the lots where legislators parked their cars were repaved with startling frequency and that whenever notices were posted and paving equipment appeared, speculation immediately began regarding the identity of the latest person who was about to be punished by Michael Ianucci. On the other hand, Ianucci did not totally begrudge his opponents their opportunities to express their contempt for Philadelphia. They were free to do so outside of Harrisburg, in their own districts; he understood and respected the need for politicians to act certain ways and say certain things in front of their constituents. He made sure, though, that such individuals knew he was aware of their comments; often, they returned to the capital to find an envelope from him with a copy of a newspaper article in which their remarks were reported, accompanied by Ianucci’s card and a short note congratulating them on getting their remarks reported in their community’s newspaper. Still, legislative opponents knew they were free to speak ill of Philadelphia with impunity so long as they did so outside of the boundaries of the state capital. If they did so within Harrisburg, however, they knew they faced far more serious consequences than being exiled to a distant parking lot. No, this will not be a curmudgeonly, left-wing rant about gun control. The Curmudgeon’s position on guns is simple: the constitution in no way guarantees anyone’s unfettered, unregulated right to own and use guns. Americans are insane on the subject of guns: there were more than 9000 gun deaths in the U.S. in 2009 and that same year, England, Canada, Australia, Japan, Germany, Israel, and Denmark combined had 466 such deaths, which means Americans either are inherently more murderous than other people or the easy availability of guns leads to their easy use and abuse. That being said, there are already about 300 million guns in private hands in the U.S. today, or about one for every man, woman, and child in the country, which means the cat is pretty much out of the bag and attempting to “control” guns now is a matter of too little, too late. Pass all the laws you want but you’re not going to get people to turn over the guns they already have and the bad guys are always going to find a way to get their hands on more. You see? As promised, not a curmudgeonly, left-wing rant about gun control at all. Instead, The Curmudgeon would like to share personal observations about the three times in his life he came into contact with guns. The first time was a very long time ago: 1968, to be precise. Martin Luther King had just been assassinated, a few cities had erupted into riots, and there were rumors – there are always rumors – that such riots would be coming to Philadelphia, where The Curmudgeon lived. Worse, it was rumored that the riots would come to the community where The Curmudgeon lived. In hindsight, the whole idea was preposterous. Even if riots spread, even if they came to Philadelphia, there was virtually no chance they were going to come to the 99.8 percent white community in which The Curmudgeon lived. There were no black people in the neighborhood to riot, and for black people to riot in northeast Philadelphia in 1968 they would have had to get in cars and drive a half-hour or, more likely, take a bus, then a train, and then another bus to get to where the white folks lived. It just wasn’t going to happen. But that didn’t prevent The Curmudgeon’s father from feeling a paternal need to protect his family. So one evening, dad asked his eldest son to bring the desk chair from his bedroom into his parents’ room. When The Curmudgeon arrived, chair in hand, dad closed the door behind him and instructed his son where to place the chair: in front of the left-hand side of his closet door. Dad then opened the closet and directed his son to stand on the chair. 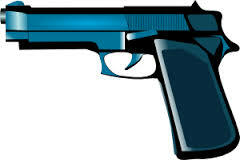 Again son did as he was told and beheld a small handgun with what looked like a blue plastic handle. And son, all of ten years old, just nodded. Fourteen years later, protection again was the concern, but this time, it was familial: The Curmudgeon’s parents’ marriage was on the rocks but they were still living together until they could sell their house. The Curmudgeon, a recent college graduate, still lived at home. His younger brother had been gone from the house for years, a refugee from fatherly wrath, and baby sister was away at college. Dad was showing signs of potential violence against mom, and he was always predisposed to violence anyway. If The Curmudgeon knew one thing, it was that if dad got violent, there wasn’t a whole lot he would be able to do about because dad was much bigger, much stronger, and much tougher than his son. He waited about ten minutes, as snow flurries began to fall, until, sure enough, someone approached him and asked him if he wanted to buy some grass. No, he replied, but he was looking for a gun. They settled on a price, and a half-hour later, The Curmudgeon returned to the same spot, completed the transaction, and returned home with gun in hand (well, in the trunk of his 1980 Ford Pinto – and cut it out, he saw you smirk), in time to catch the fourth quarter of the game. Fortunately, dad never became violent and there was no need for the gun, the house was sold, and the day after dad moved out, The Curmudgeon gingerly picked up the gun, which he had never removed from the brown paper bag in which it came, and took it to the local police station, explaining that he had found it on the ground outside his house. Now wearing a jacket and tie, The Curmudgeon was a very clean-cut-looking young man, at twenty-five already starting to go a little bald and a little gray, and the police asked no questions and seemed grateful for the little gift he presented them. Flash forward thirty years, to The Curmudgeon’s father’s death last September. As The Curmudgeon has already written, he and his sister had the unenviable task of flying 3000 miles to clean out their father’s apartment. The plan was simple: forget about “stuff,” except for anything that might have any sentimental value, and focus on finding important papers to ship home for more careful scrutiny under less stressful, time-constrained conditions. Amid that searching, brother and sister knew there were three things in particular they needed to look for: cash, because dad always believes in keeping a decent-sized stash around the house (he used the Yiddish word “puskah” to describe it); the title to his car, because he had designated someone to whom he wished to give the car; and a gun, because it was perfectly reasonable to assume dad still owned one because when he moved to California his place of employment was in Compton, a notoriously dangerous city. After working most of his life in north Philadelphia, dad must have felt right at home in Compton. You know the old joke about how you found something in the last place you looked (the joke, as the comedian David Brenner always told it, was of course it was in the last place you looked because after you found it, you stopped looking). Well, this really was a matter of finding something in the last place searched: The Curmudgeon and his sister made a systematic sweep of the tiny apartment and found an unlocked strong box with two guns and a box of bullets in the last place designated for searching. Neither was the blue gun of 1968. One was like what Johnny Carson always joked was the “teeny tiny” gun that Nancy Reagan was reported to own; the other was, for lack of a better term or any knowledge of firearms, what The Curmudgeon would call a “real gun,” a serious weapon. So, what to do with these guns? Leaving them behind was not an option; that would’ve been irresponsible. The Curmudgeon and his sister had already dumped many things down the trash chute, but dumping the guns seemed reckless: they may have been loaded and the trash eventually might’ve been compacted, and if that were the case, the bullets could go off, potentially harming something or someone. To take them to the police station or call the police and ask them to pick up the guns, that was the question. Instead of answering the question themselves, they decided to leave it up to the police, to call them and ask them what to do. “Oh, we’ll be right there. Thank you for calling,” the police dispatcher said. And a few minutes later they were there, as promised: a young Latino officer whose arms were about as big around as The Curmudgeon’s (rather considerable) thighs. He was cordial and efficient and knew what he was doing, but there, in the heart of conservative Orange County, California – although Cypress, where dad lived, is definitely the ‘hood of Orange County – Officer Hernandez absolutely could not understand why anyone wouldn’t want to keep a perfectly good gun. While describing the process the town used to dispose of guns – it ships them to a facility in Long Beach to be melted down – he wondered why the two outsiders to whom he was speaking wouldn’t want to keep the guns, even if all they did was sell them on eBay. He clearly was one of the good guys, but he was a good guy in a culture that values guns, that tolerates the havoc they wreak on people, on families, and on communities, and he doesn’t understand the role they play in so many of the law enforcement activities he undertakes every day. Okay, so it was a little bit of a curmudgeonly liberal rant about guns there at the end. If The Curmudgeon is fortunate, though, these three encounters with firearms will be his only encounters and he can live the rest of his life without touching, seeing, or being confronted with one again. While driving the prodigal nephew to school one recent drizzly morning, The Curmudgeon heard a brief story on National Public Radio about a venerable business that is eliminating the apostrophe in its name. He can’t recall the name of the company, but let us say, for the sake of advancing this discussion, that the company’s name was “Waterston’s” and it was changing its name to “Waterstons.” The explanation offered for the change was that in the internet age, the apostrophe was posing an obstacle to the company’s electronic commerce ambitions. The society is British, and as its web site – which you can find here – sadly demonstrates, rather humorless. The Curmudgeon draws no conclusions about whether the humorlessness can be traced to the group’s British origins. The Curmudgeon was absolutely charmed by the idea of an organization dedicated to the protection of the apostrophe; anyone who reads this blog and imagines The Curmudgeon to be anything less than a total fussbudget about the correct use of punctuation needs to think again. He was so charmed, in fact, that he was inspired to break into verse about this sometimes misunderstood and frequently abused form of punctuation. you learned so many years before. Will make you a friend of The Curmudgeon. The Curmudgeon underwent a colonoscopy last Thursday. He’ll spare you the gory details, but the experience did have its lighter moments. Getting to that point involved one obstacle The Curmudgeon hadn’t anticipated: the stuff you have to drink to launch the…process. He wouldn’t have imagined this possible, but the stuff tasted worse than the barium you drink before a high-contrast CAT scan – and he has had to drink a LOT of that stuff over the past six years. This stuff was worse, much worse, and drinking it at 3:00 a.m. made it even harder. So why was The Curmudgeon drinking that awful potion at three in the morning? This was his third colonoscopy in the past eight years – he has issues – and each time, the day-before regimen was slightly different. This time around, the regimen was divided into two parts. The first part begins late in the afternoon the day before and lasts, if you’d like to put it that way, about four hours. The second part begins five hours before the procedure is scheduled to be done, or in this case, at 3:00 a.m. Since this part of the process also takes four hours, it means that the only sleep you’re going to get that night is finished by 3:00, which in turn means that in addition to everything else, you’re pretty exhausted, with sleep deprivation added to, er, depletion exhaustion. Did you know that QVC and HSN are still pitching their products at four in the morning? The Curmudgeon didn’t before, but he knows now. No explanation needed beyond that. Before the procedure, you’re interviewed briefly by the anesthesiologist. Is it just The Curmudgeon’s own, somewhat limited experience or does it seem like anesthesiologists have the kind of personality you’d expect among people whose job it is to put other people to sleep? When the gastroenterologist entered the procedure room right before the anesthesiologist was to do his thing, he was nattily attired in a tie and dress shirt with long sleeves rather than scrubs or a lab coat (the anesthesiologist was wearing scrubs). Then, after the procedure, same thing: tie, dress shirt, no lab coat or scrubs. That left The Curmudgeon wondering: does he not even need to roll up his sleeves to go in there, to do that? After a colonoscopy you’re generally in a little discomfort that’s caused by the introduction of air into your colon as part of the procedure. Consequently, this is perhaps the only time in life when people will actively encourage you to break wind. This may be every red-blooded male’s dream. Some of the nurses, though, are more enthusiastic about this than others. At one point, the nurse closed the curtain so The Curmudgeon could be alone with his, um, with his wind, and when he issued forth some with particular volume, she offered “Good one” from the other side of the curtain. It was all The Curmudgeon could do at that point to resist proposing marriage to her. Once your head clears to the point where you’re ready to sit up, the nurses offer the patient refreshments: in this case, juice and graham crackers. More than anything else, it reminded The Curmudgeon of second grade and left him wondering whatever happened to Miss Silverman? The day before a colonoscopy, the closest you can come to eating solid food is jello. The Curmudgeon’s been through enough digestive issues in his life during which jello was his primary sustenance that he’s developed a serious aversion to it, though. Even so, he made some the night before his day of fasting was to begin, discouraged because all the potentially good flavors – as if there was such a thing as a good flavor of jello – were unavailable to him because the doctor forbids you from choosing any flavor that’s red or purple (because any that remains in your system looks like blood). As he expected, though, The Curmudgeon could never bring himself to have so much as a single spoonful, so the evening after the colonoscopy, he removed the lemon jello from the refrigerator to dispose of it. He was too tired to do the dinner dishes, though – a real rarity: The Curmudgeon always does his dishes after dinner – so the following morning, the lemon jello still sat where he had left it, on his kitchen counter. He picked it up, assuming he could just pour it down the drain. Nothing doing: it was as solid as it had been when he had removed it from the refrigerator fourteen hours earlier. He then left it to address with that night’s dinner dishes, in ten hours, at which time it was still as solid as it had been twenty-four hours earlier when he removed it from the fridge. What do they put in that stuff? The Curmudgeon’s gait has now returned to normal – if you’ve ever had a colonoscopy, you know what he’s talking about – and he’s happy to report that nothing intestinal is going to interrupt his curmudgeonly observations in the foreseeable future. But he’s still thinking about that “good one” nurse. In the face of such overwhelmingly positive public sentiment about both the testimony of Shaniqua Watson before council and her surprising and unprecedented success in ridding the city’s streets of snow, logic suggested that rational, intelligent people who took a different view of Watson and who would like to see her removed from her position in city government would take some time to lay low, lick their wounds, regroup, and perhaps consider the possibility of changing their strategy in light of recent events. But then, no one ever accused Philadelphia politicians of being rational, intelligent people. Amazingly, they continued their campaign against Watson as if nothing had ever happened to create such a positive public perception about her in the first place. Three days after the snow had been removed – and less than twenty-four hours after a prominent radio talk show host suggested that Watson was the biggest hero the city had seen since Rocky Balboa – the council president and majority leader raised the subject of her continued employment during their weekly meeting with the mayor. “You have to be kidding,” the mayor told them. “We’re not,” replied council president Harold Miller. “There is?” the mayor asked. “And you don’t think the million or so people who live on streets that had never been plowed before Shaniqua Watson came along don’t think we did something wonderful for them and will be inclined to show their gratitude by voting for Democrats in the next election?” Norbert asked. The next day two more council members met with the mayor and made the same argument. Two days after that he had an even stranger meeting with the only two Republican members of council and the chairman of the city’s Republican party. To this point the mayor and his staff had heard only from local officials – council members, ward leaders, and party bosses – on the subject of Shaniqua Watson. Thus, they assumed that opposition to a can-do streets department was limited and therefore easily dismissed. Within the next few days, however, they were disabused of this assumption after a series of visits by members of the city’s legislative delegation serving in Harrisburg and even one of its members of Congress. The mayor had six such meetings over a period of four days, and in each, the message conveyed to him was the same: officials who owe their elected offices to the ability of party workers to turn out the vote for them would be in jeopardy of losing those offices unless they could perform services for constituents that engendered loyalty on election day. At first Norbert did his best to listen respectfully to these arguments, but with each meeting that became more difficult. Eventually he began gently chiding those who came before him, insisting that good government was the ultimate in good politics and that dismissing someone who had become the symbol of good government in Philadelphia would be the ultimate in bad politics. The people to whom he expressed this sentiment did not understand Norbert and were convinced that he did not understand them. Norbert, for his part, was certain they did not understand them – but he stood firm on the continued employment of Shaniqua Watson as his streets commissioner.